These are the personal pages of David Viewing. You can read here about Flying in Arizona's scenic wonderland, Flying in New Zealand, The Reno Air Races, Flying in the UK and Ireland , steam engines, HMS Mars and other interests. NEW! Follow a journey across a continent in Flying to Kissimmee. NEW! The London & Birmingham Railway re-created! London & Birmingham Railway 1837. These two, quite similar, shots illustrate advancing video technology. 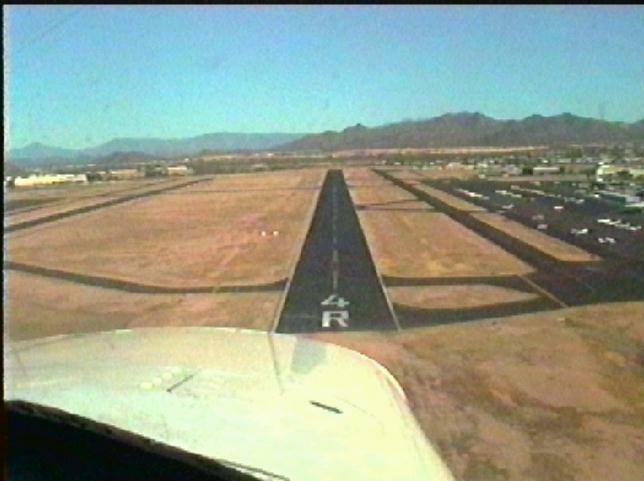 This first picture shows the approach to Mesa, Arizona in conditions of perfect visibility. It is a video capture from a PAL version Sony TR-705 Hi-8 camcorder . Mesa is a suburb of Phoenix and this 5100' runway is a lot bigger than it looks - you can taxi all day if you land in the wrong place! The second picture is a similar view of the approach to Caernarfon, Wales on a similarly perfect day (but note the 'wall of visibility' a few miles ahead). This picture is a IEE1394 'firewire' capture from a Panasonic NV-DS99B DV (PAL version again) camcorder and shows just how much things have changed. 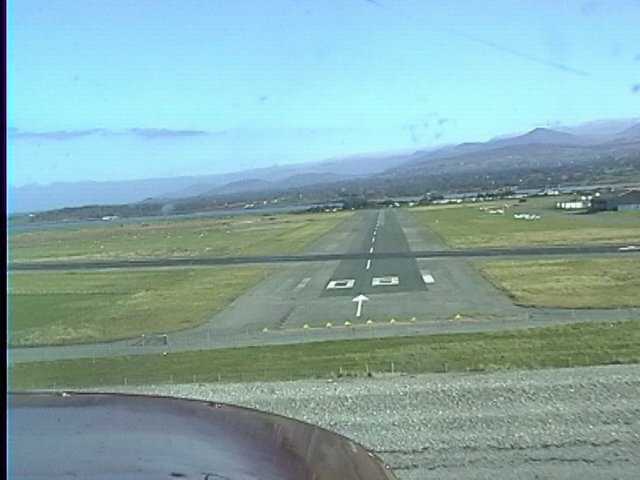 Caernarfon's runway is 940m and the Snowdonia mountains behind are no less hostile to aeroplanes than Arizona's Superstition mountains in the Mesa shot. The DV quality is stunning. However, I tested and returned 3 other DV camcorders before selecting the DV99, so buyer beware: these DV camcorders are not all equal. Watch out for grainy pictures, washed out colours and obtrusive motor noise, just to mention a few snags. Many of the pictures in these articles have been reproduced at small size to speed up loading, but can be clicked to load full size. Just press 'Back' on your browser to go back to the main article afterwards. I hope you enjoy these pictures - I certainly enjoyed taking them!